Few movies come this close to perfection. This is an intelligent and moving story of a boy who must come to terms with abandonment, loss and the casual betrayal of adults. Extremely well acted on all sides, with a bold script that dares to ask the important questions. Ingemar must try to find some balance in his life, as he is tossed from one "home" to another, like a stray dog... or, like the Soviet space-dog Laika, who was sent into space only to starve to death in orbit. "They never intended to bring her back." The final scenes of "My Life as a Dog" do win out, when the odd town's crazy old man takes a swim in the frozen river. The whole cast of peculiar town-folk come out to "rescue" him, and offer him a place by the fire, a blanket, a little whiskey... Here, Ingemar finds balance in the love of other people, so one is left, not with a sense of despair, but with a sense of hope in the midst of sorrow and loss. A film like this comes along once in a decade. This film, so my mother assures me, was to the 1980's what Visconti's "Death in Venice" was to the 1970's. People went to see it again and again in the cinema and argued about it's meaning for years afterwards. An film about a snippet of life. This film seems ordinary when watching it though interesting, but by the time the story comes to a close you realize you've enjoyed to whole film and that it's a beautiful story.I think this is a story that reaches out to all who watch it and that we can all relate to it on one level or another. 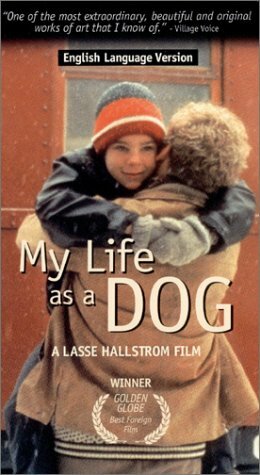 Swedish director, Lars Sven (Lasse) Hallstr?m's (1946) film, My Life as a Dog (Mitt liv som hund) (1985) tells the bittersweet story of a working-class 12-year-old, Ingemar (Anton Ganzelius), who is sent to live with his uncle Gunnar (Tomas von Br?mssen) and his wife Ulla (Kicki Rundgren) in a small rural town in Sm?land, after his mother (Anki Lid¨¦n) becomes terminally ill. In Sm?land, he encounters a variety of warmhearted eccentics: Saga (Melinda Kinnaman), a tomboy who repeatedly beats him in boxing; Fransson (Magnus Rask), a man who continually fixes the roof of his house; and Mr. Arviddson (Didrik Gustavsson), an old man living downstairs who asks Ingemar to read to him from a lingerie catalog. At one especially memorable point in the film, Ingemar clings to Saga's leg and starts barking like a dog. Upset by his strange behavior, Saga tells Ingemar during a boxing match that his beloved family dog, Sickan (which he had thought was in a kennel) has been euthanized. This, along with his mother's death, is too much for Ingemar. He reassures himself throughout the film that it could have been worse, reciting several examples, such as the man who took a shortcut onto the field during a track meet only to be killed by a javelin, and the story of the dog "Laika," the first creature sent into orbit by the Russians (without any way to return to Earth). Hallstr?m later went on to direct What's Eating Gilbert Grape, Something to Talk About, The Cider House Rules, and An Unfinished Life. My Life as a Dog is among my all-time film favorites, and it consistently ranks in critical top movie lists. The Criterion edition offers an amazingly crisp digital transfer of the film, with a clear soundtrack and score, a 52-minute film by Lasse Hallstr?m: Shall We Go to Your or My Place or Each Go Home Alone?, a video interview with Lasse Hallstr?m, and Kurt Vonnegut's reflections on My Life as a Dog. Everyone should watch this . . .
A must see for all you foreign film buffs! This film contains a brilliant mixture of depressing and inspiring moments. It leaves you feeling both lethargic and energized. Frustrated and peaceful. Basically, it touches on all your emotions. Filmed in Sweden, the scenery reminds you of the rural Midwestern U.S. Very touching film. Transfer to DVD second-rate. Make you think of your younger days-your brothers and parents. Something are growing at those ages! Definitely one of my best 5 movies. And final bonus. When they were filming the train from the birds' view, they forgot the legs of helicopter. Enjoy it.